The Langhams is a brand new development of 12 beautifully designed semi-detached houses all now ready to move in. Each property offers luxurious living through top specification interiors, including fully fitted kitchens with stone worktops and integrated appliances. Enjoy the benefits of under floor heating to the ground floor, stunning carpets and tiled flooring fitted throughout. The beautifully landscaped gardens offer the perfect space for enjoying the outdoors and entertaining friends and family. Your new home will be ready for you to move straight in! The Langhams is handily located within walking distance to Farnham station, which offers a quick commute into London. -MODERN: From the onset you can enjoy living in a low maintenance new home without the need to spend time and money on decorating. -WARRANTY: New build homes come with a 10 year building warranty, which protects you from any major structural defects to your home providing peace of mind. -FIRST USE: A new home typically comes with a wealth of new appliances such as ovens, hobs, dishwashers, washing machines, fridge/freezers, all of which are brand new and are provided with the manufacturers' warranties. -ENERGY EFFICENT: New build homes are built to a much higher standard to ensure they adhere to minimum standards of energy efficiency. -REDUCED ENERGY COSTS: Overall, new build homes are far cheaper to run and will dramatically reduce your household carbon footprint, potentially saving you money. -ENVIRONMENTALLY FRIENDLY: Using less energy than older homes and emitting less carbon dioxide reduces domestic water use by using water efficient fittings. -SECURITY: New homes come with higher levels of security with the majority of builders also pre-wiring the property for a burglar alarm system. 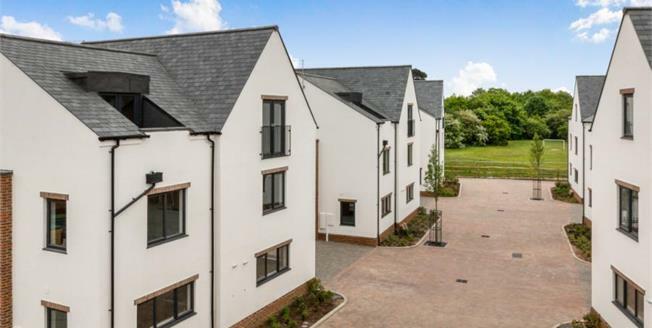 -SAFETY: New homes are built to the strictest safety standards utilising the latest fire-resistant materials and technology linking them to smoke alarms. New homes offer quality, safety, security, the latest designs and a care-free, moving environment that you can enjoy, not work on. Farnham is a charming market town characterised by handsome old buildings, contemporary restaurants and independent shops, all overlooked by the imposing castle. Dining choices include Brasserie Blanc, The Giggling Squid, and popular gastro pubs like The Wheatsheaf. Shopping encompasses an array of upmarket retail brands and independent boutiques, many of which can be found in the quaint Lion and Lamb Yard. Farnham still holds its traditional markets, including a farmers' market, and has a strong community spirit. Everyone can get involved in events such as the Feast of Food, the summer carnival and outdoor concerts. In Farnham Park, you can enjoy walks, cricket, and golf; and just a short drive out of town takes you to some of Surrey's finest beauty spots. Alice Holt Forest is a great family day out with treetop adventures at Go Ape; the Devil's Punchbowl is a must for serious walkers, and nature in all its glory can be experienced at close quarters at Frensham Little Pond and Hindhead Commons. children. Farnham Sixth Form College is rated 'Good' while Farnborough Sixth Form College attains 'Outstanding' status. Independent schools in the area include Barfield School in Runfold; Edgeborough School and Frensham Heights in Frensham. The A31 is within easy reach providing fast access to the A3, M3 and the national motorway network as well as Heathrow, Gatwick and Southampton airports. The photos shown are of the development as a whole may not be photos of the advertised plot. Specification and floor plans may be subject to change and are for guidance purposes only. Measurements are approximate only. Exact layouts may vary. Furniture layouts are indicative only.